Introducing The Majestic to our collection of luxury bouquets at Prestige Flowers. This stunning show-stopper provides an ultimate gesture with maximum impact. We have hand-picked 365 of the king of roses, premium 70cm Grand Prix red roses expertly arranged by only our elite florists. Their soft velveteen sheen and deep claret colour will leave gasps of awe and admiration which is sure to please the most discerning individual. This wondrous bouquet is arranged in a statuesque Roman stone vase to complete the opulence and grandeur of The Majestic bouquet. Included are three boxes of Godiva Chocolates tied with a golden bow, a sophisticated and exceptional assortment of the world's finest Belgian chocolates with pralines, truffles, ganaches and carres presented the Gold signature box. 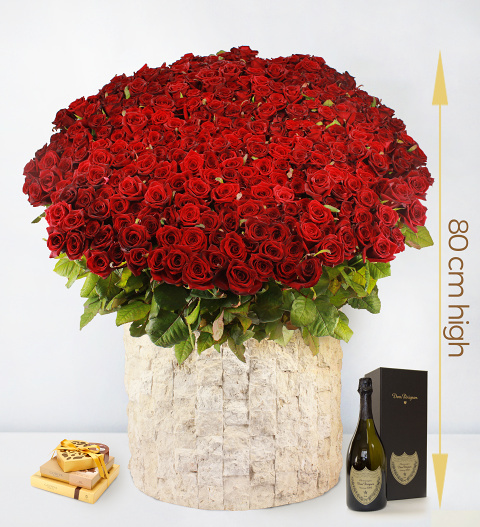 This extravagant gift wouldn't be complete without a bottle of Dom Perignon Champagne (750ml). The bottle is undoubtedly the world's most prestigious champagne, a truly special Vintage of 2006 that boasts supreme elegance. The soft floral flavour characterises the very special and distinct flavour that is Dom Perignon Champagne. The Majestic is available for UK mainland delivery only and is hand delivered by our team.